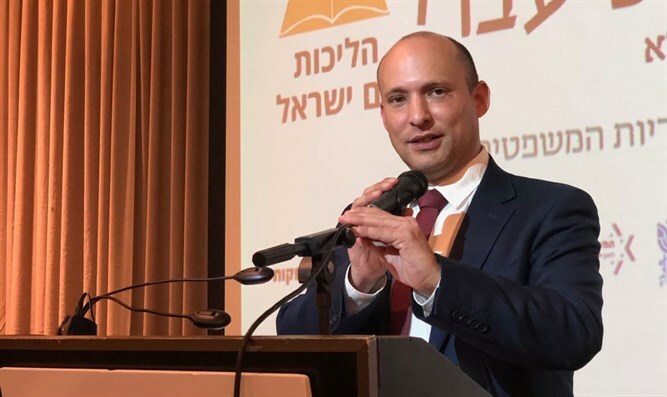 Education Minister Naftali Bennett (Jewish Home) participated in a conference on Jewish civil law in Jerusalem Thursday evening, during which he said that the Prime Minister would be cleared in the submarine affair. The case centers around allegations that Netanyahu's personal lawyer, David Shimron, pushed for a multi-billion shekel deal to purchase new submarines from German conglomerate ThyssenKrupp, which is a client of Shimron's. "I have known the Prime Minister for 12 years, he has enormous strengths," Bennett said. "Everyone has areas that need correction, but I can categorically state: I am convinced that the Prime Minister will never harm Israel's security for foreign purposes. I say this out of deep familiarity with him. "More than once we've dealt with weighty issues such as a Palestinian state, magnetometers, the release of terrorists. But I see him in the most delicate moments, he doesn't play games with Israel's security. And I'm convinced that even in Affair 3000, the submarines affair, when the facts become clear, I believe and hope that the Prime Minister will emerge completely vindicated in this matter." The Jewish Home Chairman criticized demonstrations in Petah Tikva outside the home of Attorney General Avihai Mandelblit. "I ask myself what those demonstrators want; do they want to live in a democracy where the legal authorities will decide how rowdy demonstrations are allowed to be, is this the democracy to which they aspire? "From now on when a trial starts, there'll be two demonstrations, for and against, and those who shout louder and more foul-mouthed will win the trial? Is this the democracy they're striving for?" asked the Education Minister. Bennett declared that Attorney General Mandelblit is an honest man "who loves his land and his country, pursues justice, won't be influenced by demonstrations and pressures from anywhere. I trust him, and if we want to defend the rule of law, I'm surprised at former prime ministers and advisers of former prime ministers who compete in making harsh remarks about each other."